Lake Michigan at your doorstep! Good Harbor Bay Beauty! Stunning views in a serene location. Built in 1952, it has classic cottage charm and is only a few minutes south of Leland. Spacious deck looks out towards the sunset views over both North and South Manitou Islands, and the expanse of Good Harbor Bay, from Pyramid Point in the south to Whaleback in the north. Ships pass on the horizon, past the expanses of green beach grass, past the pure sand beach that borders the clear, fresh waters of Lake Michigan. The peaceful environment and natural beauty of this property is unparalleled. 3 Bedrooms, 2 full baths; sleeps 8. I have been coming "Up North" my whole life. As a child I played on the sandy beaches of Lake Michigan, climbed the dunes, and splashed in the rivers and lakes that grace the area. As an adult, I now watch my two girls enjoy the same magical experiences of my childhood. I manage two properties in the area - one on Platte Lake and one on Good Harbor. My passion is to help you and your family/friends enjoy the stunning beauty that is Northern Michigan. 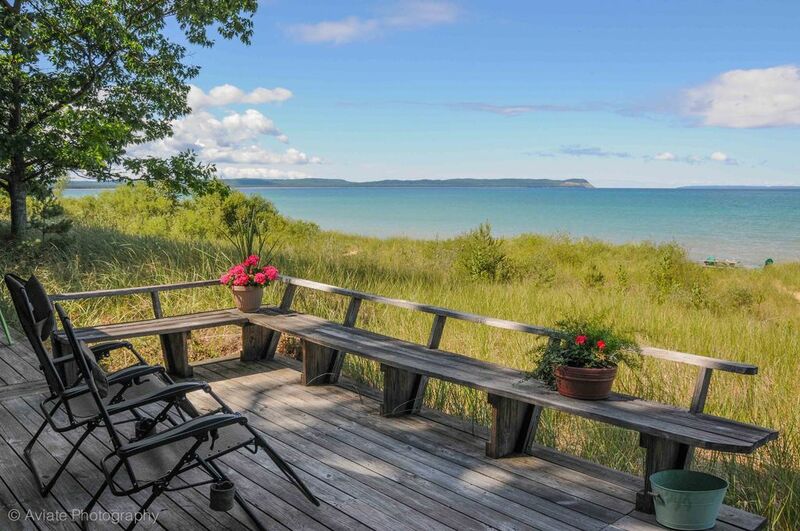 Panoramic views of Good Harbor and Manitou Islands, pristine sand, private frontage, cozy cottage charm, close to Glen Arbor and Leland. Natural beauty of the area, while being close to great food, shopping and sight-seeing. Near Sleeping Bear Dunes, Glen Arbor, Leland, Leelanau County Wine Trail and Traverse City. Sunset views of both North and South Manitou Islands and the complete expanse of Good Harbor Bay. Pyramid point to the South & Whaleback to the North. Private frontage on Good Harbor Bay on Lake Michigan. Bath towels provided, but please bring your own beach towels. There is a fold-out couch that sleeps two. Best views in the whole cottage! Table seats 6. There are also 3 barstools at the kitchen counter. The TV is a smart TV - simply log in to your Netflix or Amazon Prime account to watch all of your favorite movies. Seating for 4 at the dining table, plus additional bench seating surrounding. Lounge chairs, beach chairs, and sand-anchored sun umbrella are also available for your use. We loved this place. Beautiful picture windows facing the lake, close to Leland, Glen Arbor, Suttons Bay. Well tended older cabin with just enough space, comfortable furniture, open plan kitchen/living room for good conversations while cooking together. Weather was cold/sleet with stunning sunsets: the kind of place where you'd love to cozy up and sit on the couch and watch the waves roll in (which is what we did most of the week). If the weather was better, we would have loved sitting on the porch or wading in the water down at the beach. Great rocky beach area and picnic table. We are so very happy you enjoyed your stay, Nicolaas! We look forward to welcoming you back soon to The Shores at Good Harbor. We had a wonderful vacation at Gina’s vacation property. The location of the cottage right on the water is amazing and the view can’t be beat. The cottage is clean and stocked with necessities, like paper towels, etc which was helpful. We had a great time exploring the neighboring towns and the Dunes are a short drive away as well. We hope to come back again another time! We are so glad you enjoyed your stay! We look forward to welcoming you back to The Shores at Good Harbor soon! I would recommend The Shores at Good Harbor for your next vacation . The Shores at Good Harbor was everything that we had hoped it would be . Rustic cottage just steps away from Lake Michigan . Beautiful sunsets from the deck with awesome views of Pyramid Point ,Manitou Islands and Whaleback Point. Great location for day trips to Black Star Vineyards , Suttons Bay , Glen Arbor, Sleeping Bear Dunes and Leland/ Fishtown . Very well equipped and charming inside , this cottage was extremely comfortable with a warm and inviting ambience. My family can't wait until next summer and our return to The Shores at Good Harbor ! So glad you enjoyed your stay! We look forward to welcoming you back to The Shores at Good Harbor again soon! This is a fantastic vacation rental...family friendly AND everything you need for a memory filled vacation! Do you love Lake Michigan? It's just steps away from the beautiful deck. Do you love swimming/paddle boarding/lounging on the beach? It's right here waiting! Do you love beautiful sunsets while enjoying campfires on the beach? Look no further...this is the rental for you! This was our second year renting this property and we just can't say enough positive things about the property...we just got home from another amazing vacation! Gina, the owner of this rental is great to work with, we very much appreciate the special touches that made everything clean and comfortable. We highly recommend this rental, it has everything you need for a fantastic Michigan vacation! Gina, thanks so much...we had a great time! So glad you enjoyed your stay, Cindy! We look forward to welcoming you back to The Shores at Good Harbor! Excellent Sunset Views! Great Location! My husband and I loved staying here. If you would like to just stay and relax, the back porch and the short trek down to the lake is perfect. The sunset is just beautiful witnessed from inside the home or outside. If you like to sight see, there are small towns in both directions that you should not miss, as well as Sleeping Bear Dunes National Park. Kitchen had ample supplies for cooking. Main bedroom was spacious and very comfortable. Checking in was super easy and the owner was very nice and accommodating. We would definitely stay here again. Thank you for your thoughtful review of The Shores at Good Harbor, Christine. We are thrilled you enjoyed your stay. We look forward to welcoming you back sometime soon! Five minute drive into Leeland and historic Fishtown.